← How long is that tail? There’s a new reason to love the world’s smallest marine mammal species – so let’s talk sea otters! These voracious predators are again making headlines in the science world as a new paper comes hot off the (virtual) presses. Hughes et al. (2013) published an article in PNAS entitled “Recovery of a top predator mediates negative eutrophic effects on seagrass”. This paper is truly a local collaboration, with scientists from UCSC’s Long Marine Lab, the Elkhorn Slough reserve, USGS, CSU Monterey Bay, and MBARI. The headline? 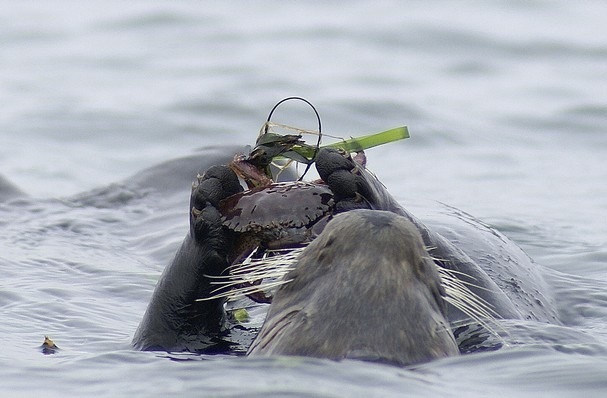 Sea otters may have saved the Elkhorn Slough seagrass habitat by doing what they do so well: eating crabs. When we think about the health of a marine ecosystem, we often think of two major ways that the system could be controlled. 1) Top down: A classic example of top down control is sea otters consuming urchins in a kelp forest. These three trophic levels depend heavily on one another, so that if the sea otters in the kelp forest are removed by a predator (humans or killer whales) and can no longer keep the sea urchin population in check, the urchins will become overpopulated and consume so much of their prey (the kelp) that the kelp disappears, taking with it other creatures in the ecosystem that depend upon it. If the sea otters are returned to the system, they consume enough sea urchins that the kelp is released from predation pressure, and the ecosystem can return to normal balanced levels. Here’s a figure by Estes et al. (1998) to illustrate this classic example. Focus on the cartoons and the arrow sizes to track who eats what in each scenario. 2) Bottom up: Think of bottom up control like the workings of a traditional garden. 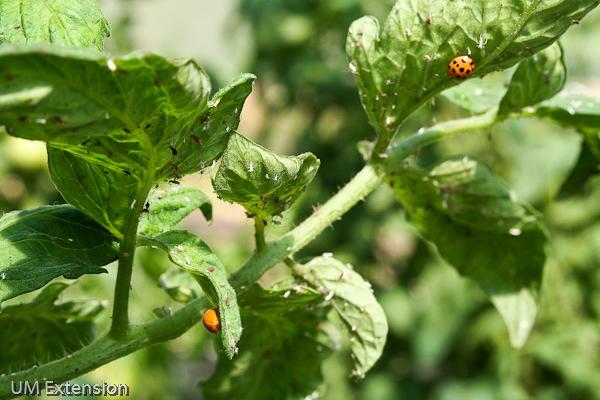 If you over-fertilize your tomato plants and they start to die off as a result, this bottom up forcing will impact the aphids that depend on the tomato plant for food, and in turn their ladybug predators. Was that example not “marine” enough for you? Let’s get back to the sea otter news! It is well known that Elkhorn Slough, an estuary located right next to MLML, is a nutrient-loaded system due to nearby agricultural activity. In the past, biologists noticed that nutrient loading was having a negative impact on the estuarine reserve’s seagrass beds, when algal epiphytes bloomed and overtook the seagrass. (That’s bottom up control!) Hughes et al. showed that in the last 30 years, that trend of declining seagrass beds was reversed, even as agricultural runoff increased! How?? Hughes et al. noticed that another thing happened about 30 years ago: southern sea otter populations recovered to the point that otters began colonizing Elkhorn Slough habitats. Was this a coincidence? The authors think that this is an example of an interaction between top down and bottom up control. Hughes et al. (2013) demonstrated that the interaction between sea otters and their prey species in Elkhorn slough created a 4-level trophic cascade that released the seagrass from top down control pressures, allowing it to flourish even in the presence of high nutrient loads. In short, the sea otters ate the crabs, which in turn consumed less algal epiphyte grazers (snails, slugs), which in turn consumed more algal epiphytes (blanketing the seagrass), which allowed the seagrass to grow. This well-timed trophic cascade was lucky for the seagrass, and all other marine critters that depend on it for habitat in Elkhorn Slough. The sea otters are helping to restore our coastline, and you can too! Just five days until California’s Coastal Cleanup Day, and it’s not to late to volunteer! Brent B. Hughes, Ron Eby, Eric Van Dyke, M. Tim Tinker, Corina I. Marks, Kenneth S. Johnson, and Kerstin Wasson (2013) Recovery of a top predator mediates negative eutrophic effects on seagrass. PNAS: 1302805110v1-201302805. This entry was posted in Jackie Lindsey, Tales from the Classroom, What's Happening at MLML and tagged fieldwork, marine mammals, sea otters, sea turtles, Seabirds, skeletons, Vertebrate Ecology Lab. Bookmark the permalink.